Boxers - whether amateur or professional - love the word. You'd struggle to find a boxer who doesn't claim it's their destiny to win a world, national or even local area title. Step forward Andrew Selby, Wales' most successful amateur boxer. He won a silver medal at the World Championships, two gold medals at European Championships and competed at both the Commonwealth and Olympic Games. 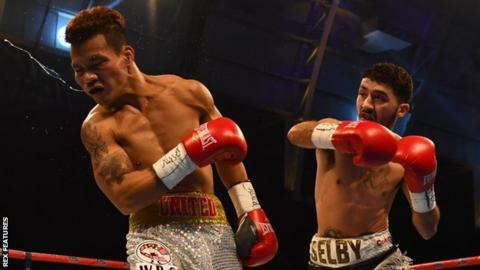 Selby's switch into the professional ranks has been seamless: nine bouts, nine wins and British, IBF Inter-Continental and WBC International titles gathered along the way. Now in just his 10th pro fight, the 28-year-old from Barry faces Mexico's Maximinio Flores at London's York Hall on Saturday in an eliminator for the WBC world flyweight title. It may be fair to say he's heading for glory, but for Selby the word 'destiny' has taken on greater significance. He has a personal destiny to fulfil after tragedy struck on the eve of his brother Lee's IBF featherweight world title defence against Jonathan Victor Barros earlier this year. The death of their mother, Frankie. "It was a big shock to the family. It was unexpected and my head was all over the place," Selby said. His brother would go on to successfully defend his belt in Wembley Arena, but it wouldn't be long until both brothers, still grieving, were back in the gym. A precocious talent, Selby admits that his career now has a greater purpose. "All my mother wanted was for me to be a world champion with my brother," he said. "That's all I think about now is making her proud." A dazzling amateur career has led to a clamour of attention since turning professional two years ago. But Selby, who was part of Team GB's boxing squad at London 2012, has admitted to a love-hate relationship with the sport. "I don't really like boxing. If I did like it, can you imagine how good I would be?" he has admitted. Becoming a new father has also brought the realisation that there is more to fight for than personal ambition, and with it comes great sacrifice. "I've never been more focused in my life. I've got one shot at that world title and there's nothing stopping me," Selby said. "I've cut out everything; I'm living in a trailer which I never leave except to go to the gym." With a victory in Saturday's eliminator guaranteeing a world title shot against current WBC champion Juan Hernandez, Selby will be one step closer to fulfilling his own destiny.